Lawsuits and investigations are excruciating. Don't get sued. Cover Your Six. All lawsuits and government investigations are painful. Almost all business lawsuits and investigations are totally preventable...if you're proactive. Businesses that wait to get sued to audit themselves are reactive. They fix their problems after a plaintiff's lawyer runs them through the ringer, and then only the problems for which they were sued. And when they try to be proactive, most businesses band-aid their problems with cheap one-size-fits-all templates. Sound familiar? You don't need an in-house counsel or your high-billing outside counsel to keep you out of court. 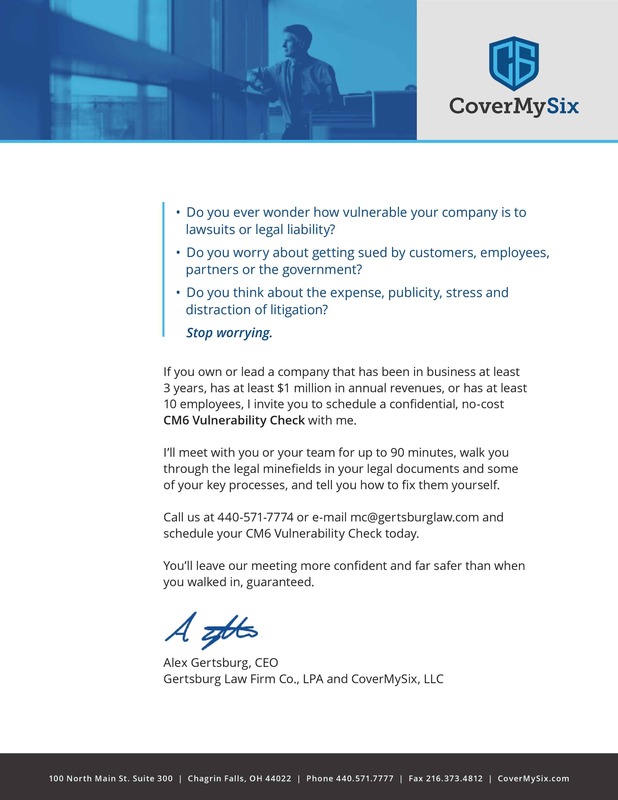 You need CoverMySix, a six-pronged legal audit where seasoned litigators, in-house counsel, and skilled corporate attorneys identify, eliminate and minimize your exposure to lawsuits, investigations, disgruntled employees and customers, and all the reputational and financial damage and attorneys fees that come with them. Sign up to hear from us about how you can save a ton of money on lawsuits. Make an appointment by calling the number below or sending a message to the left. CM6 is a service of the Gertsburg Law Firm, a full-service business law firm changing the way companies, founders and executives do business with their lawyers, where lawyers put their clients ahead of billable hours.